Abstract: Tissue phantoms are synthetic imitations of biological tissue that mimic specific characteristics such as optical, acoustic, thermal, or mechanical properties. These properties can be adjusted in the synthetic material to simulate disease progression. 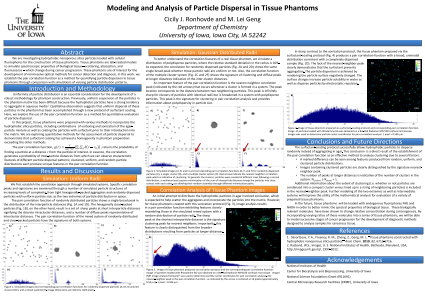 Of particular interest for cancer diagnosis, the spectroscopic properties of tissue – scattering, absorbance, and fluorescence – can be modeled in a phantom by incorporating fluorescent biomolecules that are indicative of metabolic rate. These phantoms could be used to develop a highly sensitive, non-invasive optical method of cancer detection. Mesoporous silica particles functionalized with octadecylsilane – suspended in agar – were selected as a loading platform for fluorophores because these particles provide biochemically well-defined micrometer and nanometer domains due to hydrophobic trapping of loaded molecules.